Eva will be attending the 21st Shanghai International Film Festival where she will be the guest of honour along with Italian writer/director Laura Bispuri during the Shanghai International Film Festival x Italy Film Week Forum, sponsored and hosted by Bulgari. 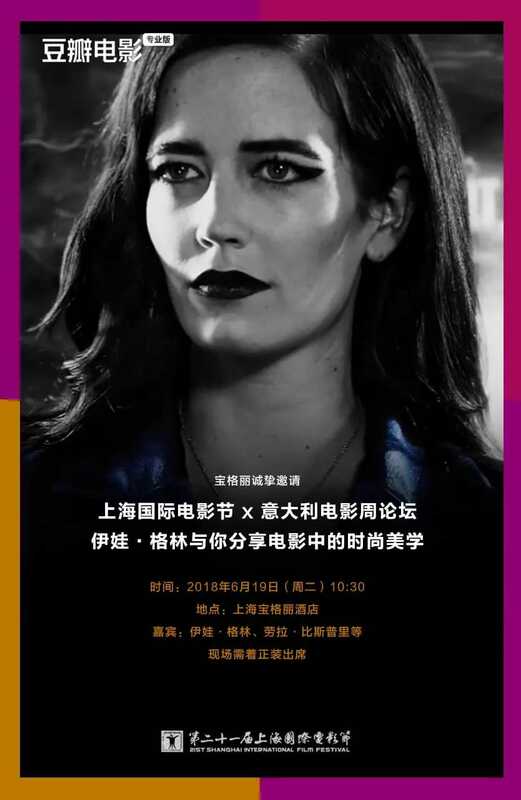 The forum, where Eva will share and talk about the aesthetics of films, will be held at Bulgari Hotels & Resorts Shanghai on Tuesday, June 19 at 10:30am. Formal attire required. The event is open to public with a very small number of tickets to be given away. For those who wish to attend the forum, you may register through Douban’s WeChat platform: send your information using the format “SIFF Italy Film Week – Name, Gender, Phone Number, Occupation (company/position)”. Announcement of the list of winners will be on June 15.